Without tracks, trains, passengers, or freight, is a railroad depot still a railroad depot? Old buildings, no matter their significance, are always inextricably connected to the ground they sit on. However, when a historic building loses its context, it can also lose its significance. Redevelopment can often mean a dismal end for historic buildings, even if they are recognized by the community as an important local landmark. Yet, Terracon’s historic preservation specialists in the Facilities division are adept at creating innovative strategies to care for historic structures and plan for their future maintenance. The Terracon team jumped at the opportunity to collaborate with the general contractor to relocate the California Southern Pacific depot in Livermore, Calif. The depot, which was originally built in 1892, was to be safely moved to a nearby location adjacent to the long-since rerouted tracks. The first step in the move process was an evaluation of the depot’s existing historic fabric, and execution of a treatment plan to ensure the depot’s safe and intact arrival at a new location as soon as possible. 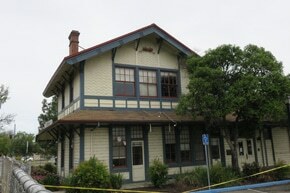 Although documentation about how to move a train station didn’t exist, the team did find records in the Southern Pacific Railroad architectural catalog from 1892 providing details about the balloon frame structure. Used as a passenger train station until the 1940s, the building later handled freight and served several commercial uses. The train tracks next to the depot were rerouted in the 1970s. When Terracon’s preservation team arrived on site, the train station appeared to have lost its identity. After visiting two other historic #18 depots along the west coast, the Terracon preservation team created plans to survey, inventory, and record every piece of historic fabric removed from the building, without damaging the material. Ultimately, the intention was to create a manual to return each historic component to its exact location, and correctly reassemble the building on its new site. Several surprises were found during the deconstruction process, and at times, it seemed the 125-year-old building just did not want to be taken apart. 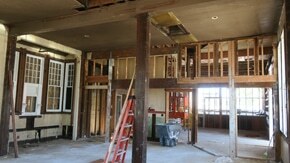 One discovery included the identification of the previously unknown original interior redwood tongue and-groove siding which was dormant, but intact, behind the modern sheetrock walls. As it needed to be removed to accommodate the interior bracing framework, Terracon devised an experimental method to remove the century-old square nails without damaging the siding boards themselves. Our historic preservation specialists were on site for nearly two weeks, working closely with thebcontractor’s crews to instruct them how to preserve nearly every component of the structure. 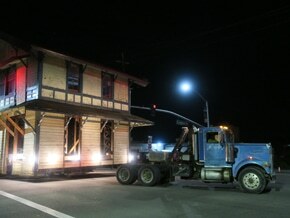 To avoid disruption from street closures and power line relocation, an overnight move was planned for the depot. Terracon was part of the on-hand team to ensure the depot remained undamaged during the journey, which took nearly five hours. More than forty years after the tracks were relocated, the depot followed. Now situated directly alongside the rails, the building that stewarded train passengers long ago will once again serve as a modern train station. Traditional historic preservation convention relies on the notion buildings belong in the places they were built. Yet, when a small train station has lost its purpose, to restore its original use in a new and rightful location, is nothing short of a homecoming. Arianna Urban has a Master of Science in Historic Preservation and is a Field Facilities Professional in Terracon's Concord office. She is a member of a new practice area within Terracon's Facilities division to responsibly repair and maintain historic structures.